What's the best way to get organic body care for ourselves? Do we really need all those products? Here's a page about natural body care, using easily-sourced organic fruit and veg! If we buy fully-organic commercial skin products with food-grade ingredients it can all get quite expensive. (And there are plenty of natural-seeming products that are not quite as innocent as the manufacturers would have us believe.) Finding good, reliable products costs money and time. A different approach to organic body care! But first just a little about why commercial body care preparations are not always all they are cracked up to be. There are some excellent commercial products available on the market. But, unfortunately, many beauty product manufacturers just cash in on our desire to use natural products. Many beauty and body care products are nothing like as pure as they appear. Commercial products often contain dozens of potentially hazardous chemicals which can cause allergic reactions or even outright damage to your health. Parabens, for example are commonly used as preservatives, even in products with otherwise good ingredients. They may be linked to breast cancer according to some studies. Some artificial fragrances have known toxicity issues for human health, causing asthma attacks, headaches and other symptoms in susceptible individuals. And if they affect us badly, there is strong possibility that they are not that great for the environment either. Some artificial fragrances, for example, are known for their persistence in the environment and may disrupt the life-cycles of aquatic organisms. If you haven’t yet become familiar with all the different ingredients in commercial products so that you can sort out the good from the bad and the ugly, (not an easy task! ), you could try a more basic approach to organic body care. So, if you are interested in health and green living, here are a few ideas for DIY organic body care, using easily-found, common ingredients from your kitchen! Use the contents of your fridge and larder for your organic body care programme! You can do so much with just simple, common ingredients for home made beauty treatments. If you use organic fruits and vegetables in your organic body care programme, you will know for sure that you are not polluting yourself with toxic chemicals. You can use your home-grown organic produce or any other organic fruit and vegetables from a reputable source. Here (below the sponsored links) are some of the natural fruits and vegetables and other foodstuffs which you can use in an organic body care beauty programme. Organic Body Care - Your Skin's Best Friends! Here are some of the most useful kitchen skin care ingredients. * Cucumber is gently astringent. Use it by itself or in a carrier oil. It is well known for applying to tired eyes - you can't help but rest your eyes if you've got pieces of cucumber sitting on them! * Carrot juice can be used for preventing wrinkles and as a face tonic. Use a juice extractor, or grate some carrots and squeeze though a fine mesh or gauze to release the juice. * Cocoa butter is a well-known for its softening effect on skin. It is often used in hand creams. * Eggs – the yolk is full of lecithin, which is very nourishing for the skin. You can use it as a face treatment. You can also make a face mask using just white of egg. It has a tightening effect upon the skin. It is easy to source good organic eggs for your organic body care programme. * Milk and cream are good in anti-wrinkle creams and face masks. 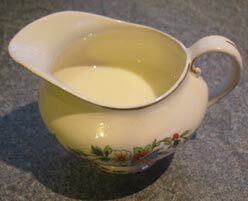 Milk can be used for morning skin cleansing routine, just add a few drops of your favourite fruit or vegetable juice. Use cotton wool to apply it. Rinse off with plain water. * Henna is a useful conditioner for hair, giving body and shine. It has been used as a safe hair colourant since the time of the Pharaohs. Black henna does not really exist - it is usually composed of Indigo but some producers also add harmful additives too. * Honey can be added to a number of ingredients. Honey has healing and anti-bacterial properties and may be of benefit in skin that is under stress. Many people swear by it in the treatment of burns. Include it in preparations with other ingredients or even use it by itself. * Lanolin is a preparation from sheep’s wool. It can be useful in skin care products as a base. If you do decide to use it make sure that you obtain medical grade lanolin. It is regarded as very safe but some people can have an allergic reaction to it, especially non-medical grade lanolin. * Lecithin is used by every cell in our bodies so is normally a good nutritional supplement. It can also be used in skin preparations as a surfactant (a substance which helps other substances to spread easily on surfaces). Mix it with cocoa butter, lanolin and almond oil or other oils of your choice. You may need to heat the oils together to get them to mix but use the least heat you can, as heat often destroys the nutritional properties of oils. For suggestions for finding organic fruit and veg see Organic food. 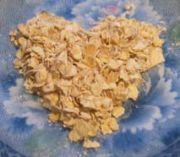 * Oats contain many vitamins and minerals which are tonic for the skin. They are calming and soothing in effect. Oats contain natural oils which are very beneficial for the skin. Soak them in milk or water for a few minutes and then use the liquid to cleanse the skin. You can also put a few handfuls into a secure bag made from a porous cloth like cheese cloth, or muslin. You can then add it to your bath water. You can use it as a body rub. Discard the contents after use. * Olive oil can be used for skin treatments with other oils, or by itself. You can also use it - with or without Rosemary as a tonic for your scalp. Massage it in and leave it on your hair for twenty minutes or so. You can cover your head with a warm towel if you like. Then shampoo as normal - you may need to shampoo your hair twice to remove all the oil from your hair. This treatment is good for dry hair and for an itchy or flaky scalp. * Rose oil and rose water are useful in tonics for the skin of the face or body. * Soft fruits such as raspberries, strawberries, peach and plum can be used applied directly to the skin or in preparations. They contain valuable enzymes and vitamins. Just crush them and use the juice. * Tea is well known for its enriching powers on dark hair. Use it as a rinse after washing your hair. It also makes a good face lotion as it has a tonic effect. * Wheatgerm oil is naturally rich in vitamin E. It can be used as a skin nutrient internally or externally. Don’t store it for long periods as it will gradually lose potency. If you mix preparations with several ingredients, store them in the fridge and use them within three days. Make again from fresh as needed. The nice thing about using such natural, common ingredients in an organic body care programme is that you can experiment with different ingredients and combinations while remaining confident that you are perfectly safe. Nevertheless, if you are sensitive to many things, or at all allergic to anything, always be careful and take professional advice if in doubt. It is good to use natural and organic products on your face and body where possible, particularly if you care about your health and the environment. Of course, it's nice to be able to use some ready-made products. There are some properly organic and natural products available from Amazon, such as this Moroccan Argan Oil, for example. This is a well-regarded skin normaliser which can help acne, stretch marks and other problems - and it's made in a women's co-operative. It's one of the richest sources of natural vitamin E and it's an all-natural product which has gained worldwide acclaim. For more on harmful ingredients in cosmetics and beauty care products see the link to Skindeep in the Green Links page. It is an incredibly useful resource. Greenfootsteps Home - for more green living ideas!